What if hardware iteration were as fast as software iteration? That question has inspired Jeff McAlvay to create Electronics Factory, a desktop pick and place machine. He believes answering it could unlock could unlock a revolution in hardware innovation. He was one of a dozen makers who submitted projects to MAKE’s Hardware Innovation Workshop “pitches with prototype” contest. The current options for making low volumes of circuit boards are certainly challenging: wait weeks to get a board back from a board house or challenge your fine motor skills trying to build boards yourself. 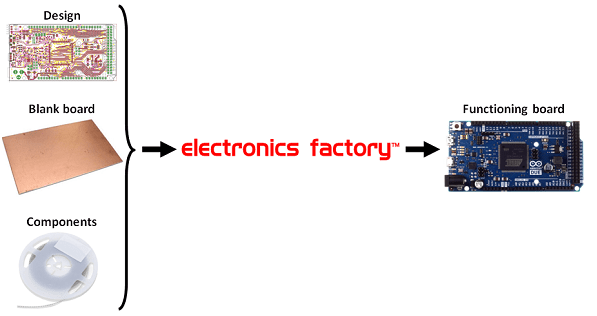 The Electronics Factory prototype is an attempt to come up with a better way by developing a reliable, easy-to-use, affordable desktop robot. “Think MakerBot for electronics,” McAlvay says. 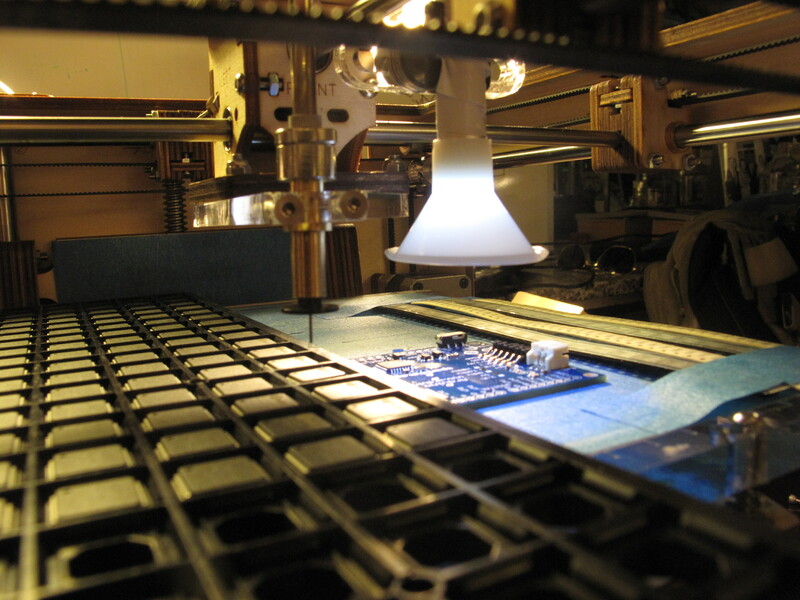 Ultimately, the machine will etch traces, apply solder paste, place components, cook, and test. The first version places components. Here’s how it works: the operator loads a design, a solder-pasted printed circuit board, and components into the machine and presses “Make.” The Electronics Factory then uses vacuum tweezers to pick up the components and place them on the board according to the design. McAlvay believes that Electronics Factory’s development could follow the same trajectory as early 3D printers. Today, the electronics industry relies on pick and place machines–massive machines capable of manufacturing huge quantities of boards at a fast clip. Similarly 3D printers used to only exist in university labs and industrial research and development facilities. RepRap and Makerbot brought these rapid prototyping machines to small businesses, startups, and consumers. The same pattern might be possible with the Electronics Factory and pick and place machines. McAlvay previously worked with a team at Chicago’s Pumping Station: One hackerspace. They demonstrated a machine just a few months ago at SXSW, where it received attention from MAKE, Adafruit, Slashdot, even Time. After that heady debut, the original team disbanded and McAlvay has continued to develop the idea with the help of Peter Christensen, a web application developer and Cody Daniel, a CNC microscope designer. McAlvay recently moved from Chicago to San Francisco to be close to a higher concentration of people making electronics products. As a result of the move, McAlvay’s team has only had a month to work on the prototype for HIW and Maker Faire. You can follow his progress on the project website. Or come to the Hardware Innovation Workshop and get a personal update. Click here to register.